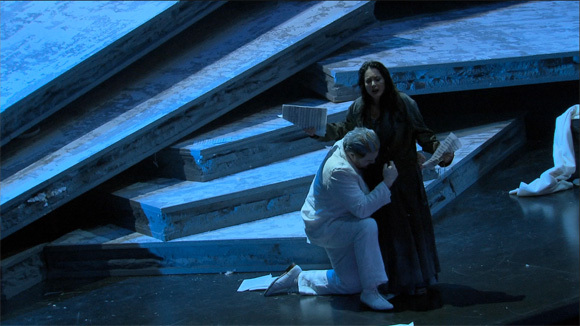 Richard Strauss’ last opera Die Liebe der Danae has a pretty chequered production history. It was scheduled to premiere at the 1944 Salzburg Festival but that was scuppered when all theatres were closed following the July bomb plot. A special exception was made for Die Liebe der Danae in that a single, public dress rehearsal was allowed at the conclusion of which Strauss is said to have bid farewell to the Wiener Philharmoniker with the words quoted in the title. It then remained unperformed until the 1952 festival where it got its true premier followed by productions over the next two years in most major European houses. After that it pretty much dropped out of the repertoire with occasional performances in Germany but apparently the production recorded at the Deutsche Oper Berlin in 2011 is only the sixteenth production all told. It’s a bit hard to see why it has been so neglected. The music is perfectly good Strauss though maybe it lacks a headline aria of the “Es gibt ein Reich” variety. Maybe the subject matter was just too frivolous for the immediately post-war world; it’s described as “A Joyful Mythology in Three Acts”. In any event, I was happy to discover it. Given the unfamiliarity of the piece a plot summary may be in order. Pollux, king of Eos, is broke and his creditors are pressing. He sends his four nephews, all kings and each married to a former lover of Jupiter, off to Lydia to try and find the fabulously wealthy king, Midas, and get him interested in marrying Pollux’ daughter Danae. This works pretty well except Jupiter is impersonating Midas and falls for Danae himself, sending her dreams of himself as a shower of gold. Annoyed that Danae seems to have fallen for Midas, disguised as the messenger Chrysofer, Jupiter curses Midas so that anything he touches will turn to gold, whether he wants it to or not. Inevitably his thing with Danae gets to the touching stage. Jupiter revives her just enough to allow her to choose between him self and Midas. Of course she chooses the latter so Jupiter revokes the gold turning power and consigns them to poverty. Jupiter is now totally disillusioned with love, despite the best attentions of his four exes. In a final scene with Danae he realises that there is something transcendent about mortal love that a god will never experience. Kirsten Harms production is fairly straightforward though with some neat touches. The “shower of gold” is actually the score of the piece falling from an upside down piano that remains above the stage for the entire performance. Even in her final poverty it’s the one thing that Danae holds onto. There’s also humour as the palace is stripped by his creditors. All the artwork seems to represent Jupiter seducing one or other of his nephews’ wives. When we first see them they are accessorised so we can tell who is who. For example, Leda has a swan purse. Harms and her team assume we know our myths. There’s also a very funny scene involving a rather athletic Jupiter, a bed and his four squeezes. All in all, the relationships between the characters are well brought out and there is excellent chemistry between Jupiter and his lovers and Midas and Danae. The changes of mood are very much helped by a brilliant lighting plot by Manfred Voss. There aren’t too many household names in the cast though I imagine they are better known in Berlin. 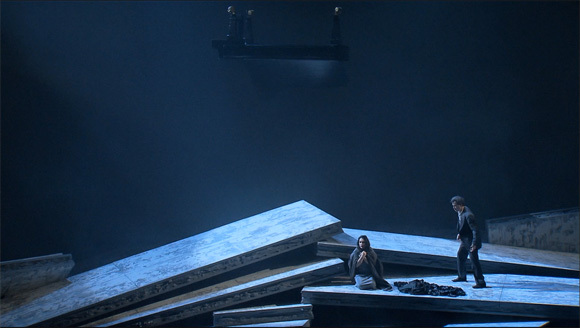 Danae and Midas are played by Manuela Uhl and Matthias Klink. They both look good and sing very beautifully but they aren’t big voices. Their bios suggest a strong bias to Handel and Mozart though Uhl does seem to have sung Salome. I’d be curious to hear these roles sung by singers I associate more with Strauss. It was bothering me a bit all through the first act when both seemed to be coping but with little in reserve and then in walks Mark Delavan as Jupiter as everything ratchets up a notch. He, of course, is a big man with a big voice and he’s excellent here despite Jupiter’s music often being cruelly high for a bass-baritone. My reservations about Uhl and Klink are minor though and they do a great job with the big “gold” duet in Act 2. The minor roles are all perfectly adequate with some excellent singing and comic acting from the four lovers played by Hila Fahima, Martina Welschenbach, Julia Benzinger and Katarina Bradić. The orchestra and chorus sound fine and Andrew Litton gives us a lush and layered reading of the score that sounds, unsurprisingly, like late Strauss. The Blu-ray package can be given an unqualified recommendation. The video direction by Myriam Hoyer is nicely balanced between long shots and close ups and only once does she get artsy. I really felt that I was seeing Harms’ production rather than what the VD thought I should see. Maybe we need more women video directors? The picture is 1080i and does full justice to the lighting plot; no easy feat. The DTS-MA-HD 5.0 sound is clean, spacious and well balanced lacking only the final clarity of uncompressed surround sound. The PCM stereo track is pretty good too (I watched the first two acts at an ungodly hour with cans on). There is a good synopsis on the disk and an OK “Behind the Scenes” feature showing mostly footage of a public rehearsal. The documentation has a chapter listing, a synopsis and an essay on the work’s history and impact. There are English, French, German, Italian, Spanish and Korean subtitles. Since this is the only available video recording of this work it’s good that it can be recommended from just about every angle. 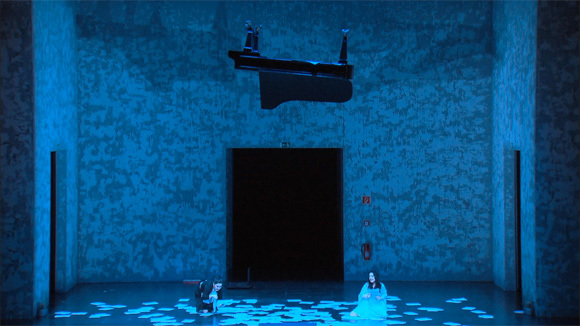 This entry was posted in DVD review and tagged benzinger, blu-ray, bradic, delavan, deutsche oper berlin, fahima, harms, hoyer, klink, litton, strauss, uhl, voss, welschenbach by operaramblings. Bookmark the permalink. It seems there are a lot of pianos hanging around these days. 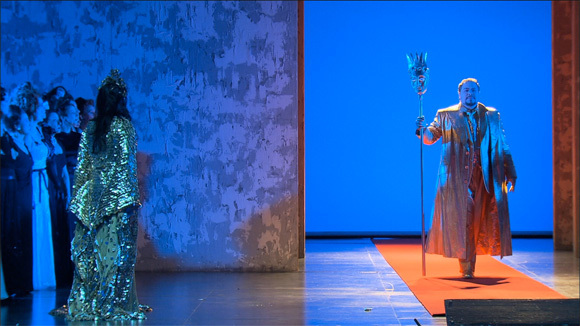 At least in my recent viewing: The Salzburg Ariadne, and Fierrabras, to name two. And now this one. I’ve been wavering about Danae, and now, with your thoughts in mind I am ready to check it out. (I liked M. Klink in Die Entfuhrung) Thanks for this review!